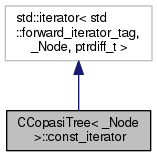 A const forward iterator used to traverse the tree. Definition at line 166 of file CCopasiTree.h. Default constructor. Note: When no argument is given the iterator points to the end of the tree. Definition at line 184 of file CCopasiTree.h. Definition at line 192 of file CCopasiTree.h. Definition at line 199 of file CCopasiTree.h. Definition at line 218 of file CCopasiTree.h. Definition at line 205 of file CCopasiTree.h. Definition at line 237 of file CCopasiTree.h. Definition at line 211 of file CCopasiTree.h. Definition at line 226 of file CCopasiTree.h. A pointer to the current node. Definition at line 175 of file CCopasiTree.h. Referenced by CCopasiTree< _Node >::const_iterator::operator!=(), CCopasiTree< _Node >::const_iterator::operator*(), CCopasiTree< _Node >::const_iterator::operator++(), CCopasiTree< _Node >::const_iterator::operator->(), and CCopasiTree< _Node >::const_iterator::operator=().